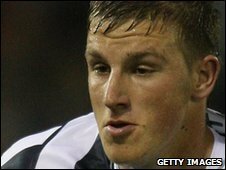 Barnsley have made their second Premier League frontline loan signing in a fortnight by bringing in West Bromwich Albion's teenage striker Chris Wood. The New Zealand international moves to Oakwell on a three-month emergency deal and follows Scotland's Garry O'Connor after his move from Birmingham City. The 18-year-old, who is 6ft 2ins tall, played in three games at this summer's World Cup in South Africa. He goes straight into the Tykes' squad for Saturday's clash at Reading. Auckland-born Wood, who has already won 13 international caps for New Zealand, first came to England in 2008 when he joined Albion's academy. He has since gone on make 27 first-team appearances for the Baggies, hitting three goals - but he has featured just twice since Albion returned to the top flight. He came off the bench to score the Baggies' second goal in a 2-0 League Cup win at Orient in August - and also featured as a late substitute in the 1-0 defeat by Liverpool at Anfield five days later. Barnsley stand 10th in the Championship table, but would be higher if their away form matched their results at Oakwell. They have scored nine times in four home games at home, where they are unbeaten this season, having picked up 10 points out of a possible 12. But, ahead of Saturday's trip to the Madjeski Stadium, they have picked up just one point in three away matches.